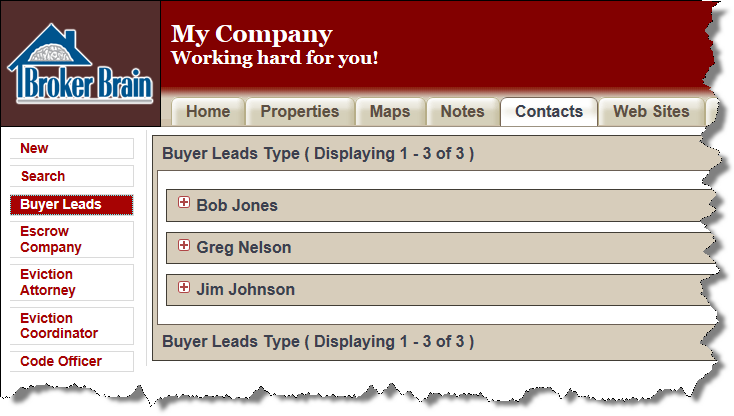 Add any buyer leads to the Contacts tab, designating the Contact Type as Buyer Leads. See Adding a Contact for more information. 3. Click Add. All Buyer Leads that are in your contacts list will appear, listed alphabetically by first name. 4. If your contacts list is large, you can search for the contact by typing their name or a portion of their name in the white box and clicking the Search button. For instance, in the example above, searching for "jo" would return Bob Jones and Jim Johnson. 6. Add any other desired contacts. 7. Click the black X to close the Search box. The added buyer leads will now display as shown below. Click the button next to the contact name to view contact details. To remove a contact, click the button located next to the contact name and select Yes in the confirmation dialog box. 2. 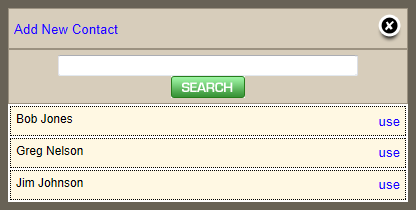 Click the + next to a contact's name to see his/her detail. You can remove an address from a Buyer Lead's list by clicking the button adjacent to the address and confirming the deletion in the subsequent dialog box. You can also reassign the lead's addresses to another lead by clicking the Reassign button. For detailed instructions, see Contact Reassignment. See Contacts Tab for detailed information on working with contacts.